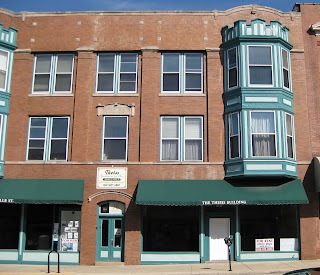 Car stories keep popping up in anecdotes people tell about the early days when the Aurora Branch met in the Odd Fellows Hall. And with good reason! 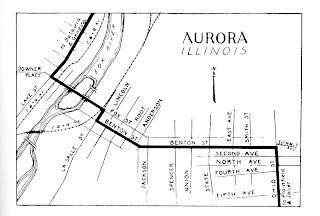 That block of South LaSalle Street was “an early automobile commercial center in Aurora” and was listed on the National Register of Historic Places in 1996. 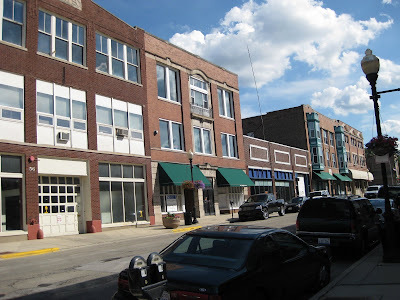 When you take a close look at the buildings that flank the Odd Fellows Hall, you see that they were originally designed as automobile dealerships. Also amazing to note—this block of LaSalle Street, between Benton and Fox, was once on the original Lincoln Highway route through Aurora. No wonder they were selling cars there. This map is from a reprint of A Complete Official Road Guide of the Lincoln Highway, Fifth Edition, 1924, page 319. 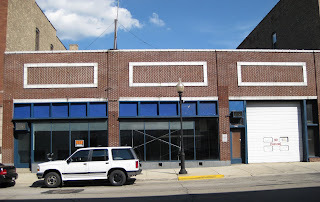 Immediately north (left) of the Odd Fellows Hall is the Coats Garage. 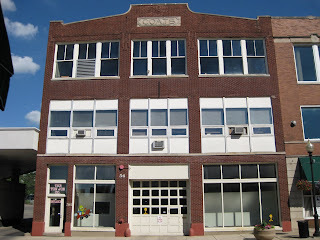 Coats Garage “was the first automobile sales and service building built in the LaSalle Street Auto Row Historic District specifically for this use. Constructed in 1907, it still features the original elevator that transports cars to the second and third floors for storage and servicing. Coat’s line of cars in 1912 [the year the Odd Fellows Hall was built] included Chalmers, E.M.F., Hudson, and Flanders. It was constructed with large “I” beams that span the width of the building, providing a large open space without columns for the display of automobiles. The current owner indicated that 30 modern cars can be stored on each floor.” This is probably the dealership where Fred Schleifer bought his Hudson Terraplane. 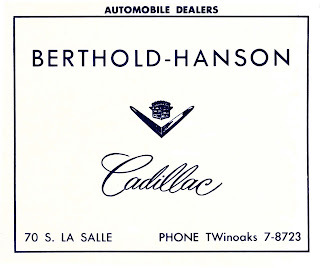 Berthold-Hanson Cadillac was an enduring business. Here is their advertisement from the 1964 Aurora City Directory. Goal: To collect and share memories about the Aurora (Illinois) Branch of the Church of Jesus Christ of Latter-day Saints (1932 to 1965), its members, meetings places, programs, and related topics. Remembering those wonderful, crazy, heart-rending days and those kind, faithful, funny people, we who were part of the branch will recognize more clearly the indelible mark the Aurora Branch stamped on our souls. Others, not lucky enough to have been part of that gospel crucible, may discover what it meant to be a Mormon in the mid 20th century when, for the faithful, all-out devotion was hardly enough. I grew up in the Aurora Branch, oldest granddaughter of the branch president James T. Greer and his wife, Myrtle. My father Robert L. Erekson was the second branch president. Fitly Framed Together: The Life and Testimony of Bob and Louise Erekson, edited by Ginger Hamer, is now available on Amazon.com. Order your own copy of this wonderful memoir. Read the story of the Aurora Branch as told by those who lived it. Who Are the Odd Fellows Anyway?